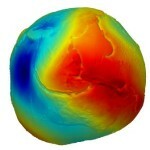 The paper presents the method of fundamental solutions (MFS) applied for global gravity field modelling. MFS as an inherent mesh-free method is used to derive the geopotential and its first derivatives from the second derivatives observed by the GOCE satellite mission, namely from the radial components of the gravity tensor. Unknown coefficients of the approximate solution by MFS are determined at the source points located directly on the Earth's surface. Afterwards, the disturbing potential or gravity disturbance can be evaluated at any point above the Earth's surface. To get their values on the Earth's surface, singularities of the fundamental solutions need to be overcome. In this paper two strategies are used: (i) the source points are located on the fictitious boundary, which is situated below the Earth's surface, or (ii) ideas of the singular boundary method that isolate the singularities are implemented. The paper studies how a depth of the fictitious boundary influences accuracy of the MFS solutions. All particular solutions are compared with the GOCO03S satellite-only geopotential model and the EGM-2008 combined model. Finally, the geopotential on the DTU10 mean sea surface is evaluated from the MFS solutions resulting in the W0 estimates.